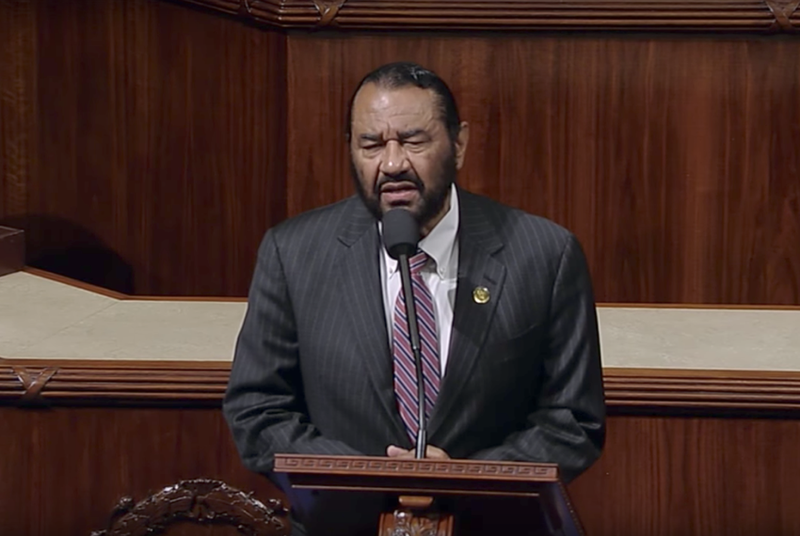 U.S. Rep. Al Green's effort to push the U.S. House to vote to impeach President Donald Trump quickly died Wednesday under bipartisan criticism for the Houston Democrat's move. Hours after he stood in front of a nearly empty House chamber to introduce articles of impeachment, Green sat alone in the middle of the chamber as the House voted 364-58 on a "motion to table" the resolution, effectively killing it. Democratic Texans largely joined their Republican colleagues in supporting the motion to table Green's resolution. Of 36 Texans in the U.S. House, only Lloyd Doggett of Austin, Filemon Vela of Brownsville and Sheila Jackson Lee of Houston, all Democrats, joined Green in voting against the measure to table. U.S. Reps. Marc Veasey, D-Fort Worth, and Joaquin Castro, D-San Antonio, were among four House members who voted present. Green’s articles of impeachment accused Trump of committing “high misdemeanors” while in office and asserted he is “unfit to be President.” Yet his resolution did not touch on Russia or that country's potential interference in the 2016 elections, the issue that some Democrats have argued could warrant an impeachment vote in the future following the conclusion of an ongoing investigation by U.S. Special Counsel Robert Mueller. In laying out his resolution on the House floor midday Wednesday, Green called it one of the “greatest moments” of his life. He proceeded to thank his staff for their help drafting the resolution before reading all eight pages of it aloud. Among the incidents included in Green's resolution are Trump's defense of white supremacists protesting in Charlottesville, Virginia; his criticism of NFL players for kneeling during the national anthem as a protest of police violence; and, most recently, his retweeting of anti-Muslim videos from a far-right British account. The resolution also mentions Trump's executive order aimed at creating "a partial shutdown of immigration from mainly Muslim countries" and Trump's treatment of Puerto Rico after Hurricane Maria. In recent months, Green has threatened to bring articles of impeachment against Trump before the House multiple times, including in October, when he said he would force a vote and then backed down. Under House rules, after Green introduced his resolution Wednesday, the chamber had to vote on the measure in the next two days unless a vote to table the resolution was successful. Following Green's speech, the House's top two Democrats – U.S. House Minority Leader Nancy Pelosi and Democratic Whip Steny Hoyer – released an unusual joint statement announcing their support for tabling Green's resolution. Green also thanked the American people who support his efforts. U.S. Rep. Gene Green, a fellow Houston Democrat, released a statement following the vote explaining why he supported tabling the resolution. “While I disapprove [of] President Trump and most of his policy actions since he has been in office, I believe that we should allow our judicial institutions to do their job before we begin to debate impeachment of the president,” he said.